Knitty Gritty, Bam and Cats! The Punk Knits episode aired today! I don't actually have tv but I heard about it from a knitting pal. I hope it's good and I don't act like a dork! ha! Vickie is the consummate tv host and that was soooooooo fun to film!!!!! The book comes out in less than two months now and I can hardly wait! So what could Bam and knitting have in common? Well, in December he learned to knit and took to it with a fury! 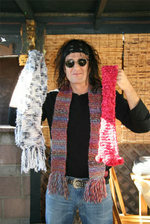 He knitted up something like ...18 scarves? Crazy! He adorns them with mad rasta like fringe and tons of pom poms and ....well, needless to say, everyone in the family received a scarf this year...but to their surprise, they were from HIM and not from me! Bam's brother Peter has three cats, Chaos, Mayhem and Havoc. And Chaos is the little princess who decided the bed was hers. Boy did she beat up Havoc when he tried to get in it!!!! Hilarious! It's always good to know what someone is knitting isn't it? Currently, I have the never-ending Bam sweater which is a simple top-down raglan seamless sweater knit on size 8 needles. I'm almost done with the body, almost done with one sleeve....nearly there. nearly there! But it's black of course and this makes for tough knitting when I'm tired. Ah well. One must sacrifice for rock n roll! What else....? Hmmmm......I finished up a feather and fan scarf for my mum in law and hats for both her and my dad in law. Lovely. Of course, I forgot to take pics in the midst of the Xmas madness. A very big cyber thank you to everyone for your loving thoughts and kind wishes regarding my father's death. It's been a rough year losing both parents but I feel blessed to have been loved by them. Their deaths have made me appreciate what I have in my life and made me realize how truly lucky I am to love my husband so much. Sappy? Yeah, you betcha! 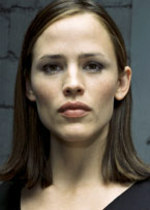 Today is the day............THE NEW SEASON OF ALIAS COMES OUT ON DVD! Yes, I am a certified member of AA.......Alias Anonymous. Damn, I am so addicted. We've been to Blockbuster and rented the first three dvd's. But in true addict fashion, I have to earn it and work a bunch first. I knit up a quick pair of booties and a hat for our friends baby. I used Rowan Wool/Cotton as it is one of my faves for wee ones. So soft and so nice to work with. The hat is from Frugalhaus but the booties were a private pattern so I cannot share those. The Turkish Delight is for the mother cuz it's her fave candy! Put up a site where you have no company, no employees but you have a concept. Get people to do loads of work and send it in to you. Put up disclaimers so you cannot be sued by the 'big guys'. Offer up small cash prizes and coupons to other sites. Is it like getting you to do all the work and you get next to nothing? We are working on many many ideas for Punk Knits! We have needles coming out sooooooon and we are working on a TV show idea. If the show happens, we will put it up on the punk knits site as clips. In the meantime, I am hard at work on the patterns! I am going to Unwind tonight to meet Adina Klein the Fashion Director for Vogue Knitting and Knit One. Can't wait to meet her and preview the new issue of K1. However, I think it's the 'all guy' ish. Ah well. Still be cool to meet her. And hang with other fiber fiends. And talk freely about knitting with other addicts. I spent my Friday/Saturday building Bam a website for his video editing/directing stuff! Check it out, baby! Has anyone else read about or seen the work of Banksy? This guy is amazing and most definitely a hero. Yes! 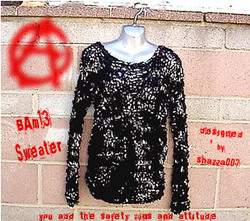 I finished the third, yes, THIRD version of the BAM13 Sweater. This one is happenin'. I am okay with the neckline after much debate about it. I think on a later version, I would still do it slightly different, but the basic concept will be similar. Whew. I promise not to start another knitting project until I finish all WIP's! I've also been adhering to a strict yarn diet. Due mainly because of our van's transmission cost but also, we need the money to press up our cd! On an art and music note, our best friend, Jo Almeida aka Jo Dog of the Dogs D'Amour happens to be an amazing artist. In particular, check out his guitar sculptures. They are made from PAPER! Seeing them in real life is nothing short of astonishing. I am leaving for Minnesota in a few days time again. Going to go help out my parents and be there for my dad's birthday, too. I'm looking forward to seeing them and breathing that nice, clean air. Ever since we came home from Hawaii, we've been eating so well! Bam has been inspired to create the most amazing meals every night. From Grilled chicken with roasted pasilla peppers served with a salad of tomatoes, cucumbers, capers, artichoke hearts in a sauce that he made from stuff in our cupboards/fridge that I don't even notice.........to fresh papaya served with lime .....to grilled wild mahi mahi....well, I'm just not explaining it enough! I mean, he makes these sauces for marinades and salad dressings that are simply to die for. I feel so healthy! Plus I've been kickboxing to a DVD lately and having a blast with that and getting my aggression out! Nothing like punching and kicking and then sitting down to knit. I love the craziness of that! I just found out that Indie 103.1 just played us again today.......during the day! I knew they had played us on their local show but I sure did not expect to get any airplay during their regular programming hours.!!! I am flipppppppppppin out!!!!! Maybe it was a fluke, maybe it was an accident, ...........maybe i'm just really happy about it!